Every month, the ECCDC offers unique professional learning opportunities at our Thorold location and at various partner sites around the region. These sessions are open to all individuals studying or working within Niagara’s early learning and child care community. They are made available for very little cost thanks to the ongoing support of Niagara Region Children’s Services and other local sponsors. We welcome educators from other near-by communities to attend our advertised sessions should space allow. Every ECCDC professional learning opportunity is designed to support emerging trends in the early learning and child care sector, prompt reflective thinking, deepen understanding of children’s learning, and give you practical strategies you can use right away. Sessions are facilitated by ECCDC Team members, our community partners, or nationally known speakers. Each training session includes nutrition breaks, training materials and in many cases, highlights of related publications and resources. We believe that reflective practice and mentoring relationships are important facets to learning and growing as educators, thus the sessions include opportunities for small group discussion, sharing of experiences, and plenty of time for questions. Whether your goal is to enhance your professional practice, boost your motivation level, deepen your professional relationships, or grow and develop your organization, you can count on the ECCDC to make the most of your valuable time. 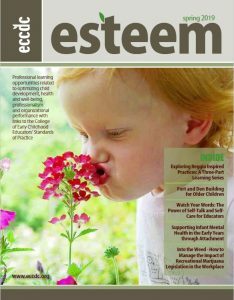 Esteem magazine is the ECCDC’s quarterly professional learning training calendar. Any of the training sessions listed in Esteem magazine can also be customized and delivered on your premises, especially for your staff based on the interests , strengths and goals of your staff team. Register for any of these upcoming sessions and more online! Find out what others say about sessions from previous issues of Esteem.